Balloting for the next election of AAS Officers and Councilors will open in mid-December 2015 and close at the end of January 2016. 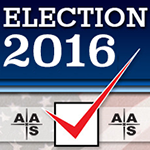 All AAS members eligible to vote in the election will be notified once the ballot is available. Every vote is important, and those elected will be empowered to decide the direction and goals of our Society. We are grateful to the following AAS members who have agreed to stand for election. Click on a name to read the candidate's statement. Please support the candidates' dedication, and help define the future of your Society, by voting. The Nominating Committee prepares slates of candidates for Officers and Councilors and helps prepare slates of candidates to serve on the Publications Board and Astronomy Education Board, as specified in the Constitution & Bylaws. Below is the current Nominating Committee's proposed slate of candidates for Officers and Councilors. The Vice-Presidents, as representatives of the Council, are responsible for the overall scientific content of the Society's major meetings. They select invited speakers, review proposals for special sessions, and support and advise the Executive Officer in maintaining the scientific quality of the program. The two senior VPs serve on the Executive Committee. The Secretary prepares and distributes agendas and minutes of Council meetings; collects, counts, and certifies ballots for Society elections; solicits nominations for AAS prizes and awards; and selects session chairs for AAS meetings. As members of the governing board of the AAS, Councilors have the legal responsibility to manage, direct, and control the affairs and property of the Society. Within the limits of the Bylaws, the Council determines the policies of the Society and changes to them, and it has discretion in the disbursement of the Society's funds. The US National Committee for the International Astronomical Union (USNC-IAU) represents the interests of the US astronomical community and safeguards the intellectual vigor of the Union. Please note: Members eligible to vote will be notified when the electronic ballot is posted on members.aas.org. Members for whom we do not have email addresses will receive a paper ballot by first class mail. You may verify your email address on our members-only site and if necessary send corrections to address@aas.org. Any other member wishing to use a paper ballot may request one by phone (202) 328-2010 ext. 115, by fax (202) 234-2560, or by email to ballot@aas.org. If possible, include your member number with your request.